This is a beautiful, practical large shoulder bag made from high quality linen fabric sourced exclusively from Europe. It is lined in a contrasting red cotton fabric and interlined with a Heavyweight interfacing to give the bag strength and body. There is an added border in the same red lining fabric at the top of the bag which, as a contrast to the main fabric, sets it off beautifully and also adds an extra inch in height. There is the added feature of a wide strap at the top of the bag with a magnetic catch to close the bag so that items inside do not fall out. 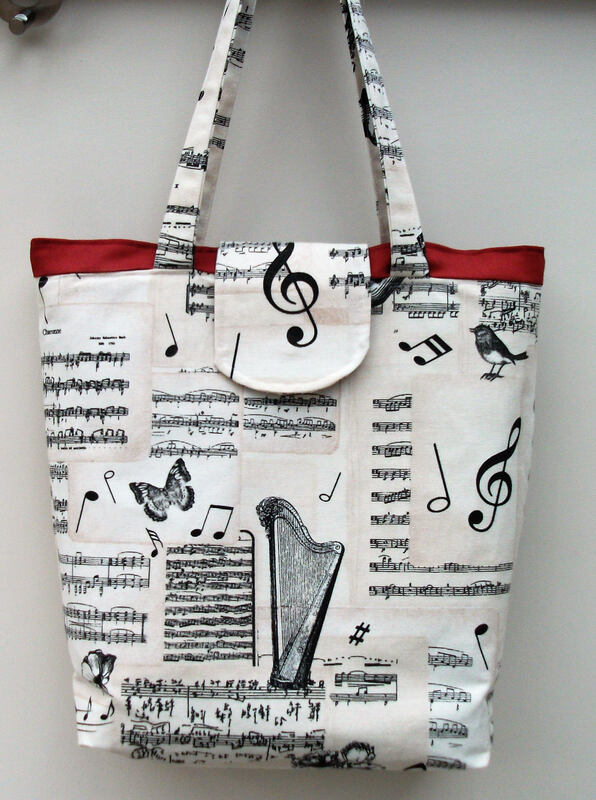 The bag can be used for carrying music, books, shopping, or a myriad of other items. 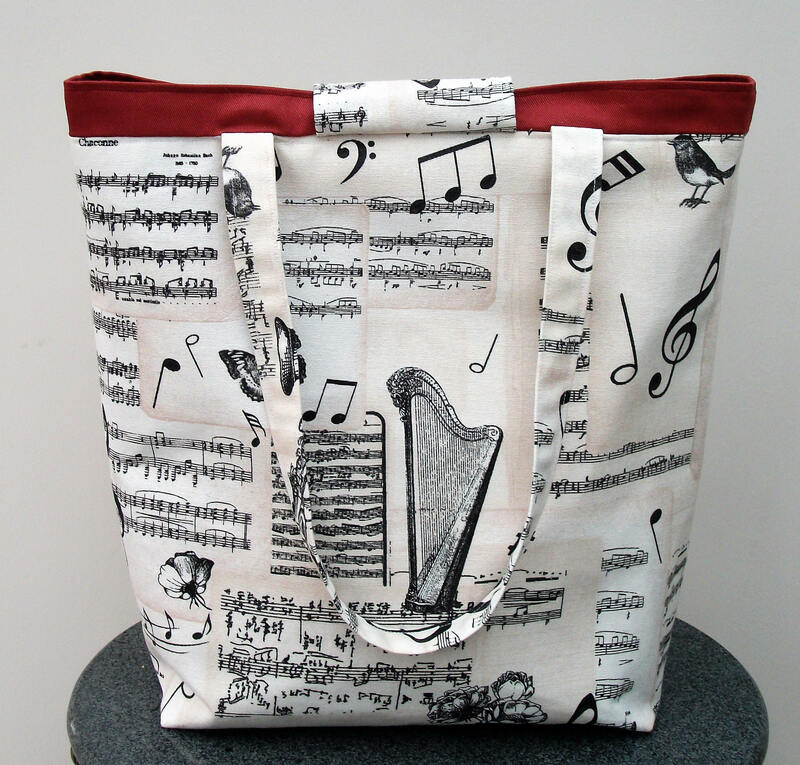 It will comfortably hold A4 sized books or music scores and as the bag is 5 inches wide, it can hold lots more besides! The straps are 20.5 inches or 52 cms long so the bag can be carried easily as a shoulder bag. They are made from quadruple thickness of the main music pattern fabric and triple stitched to the bag for strength and durability. 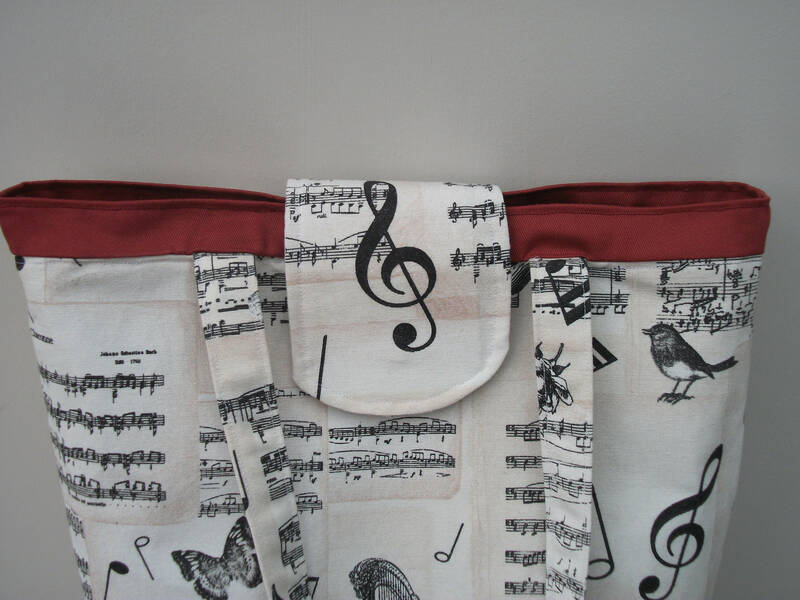 There is a small inside pocket to keep keys, tuning keys or even sweeties safe! The beautiful fabric has a pattern of a harp, a violin or a saxophone and the pattern can be varied accordingly - please state options. I can do a mixture of the instruments - such as a harp on one side and violin on the other....just add a note to your order . 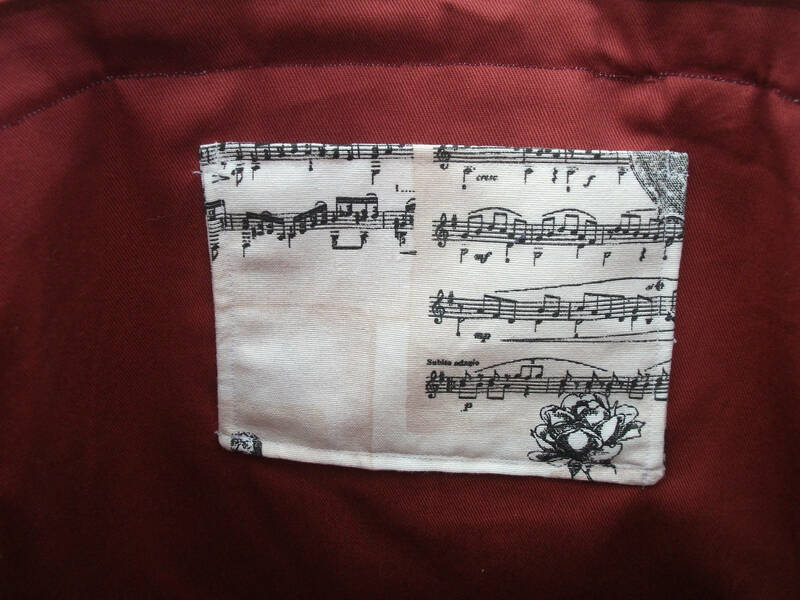 All of my music themed bags are named after composers as the fabric pattern has authentic snippets of so many lovely compositions on it . There is part of a Berlioz work, part of Rachmaninov's " Études-Tableaux" Op. 39, and many Bach pieces - 2 transcribed for guitar and his "Arioso" from Cantata BMV 156. So "Bach" it is ! please note pattern placement may vary.